I can’t believe how fast these weekends fly by! The structure does keep us hopping, it’s three classes, ‘show and tell’ for about 65 people one night and Vendor’s Night the next. Classes this year were really interesting and we had some terrific teachers. MASTERING SOCK HEELS with Amanda Schwabe of Aknitica, DOUBLE KNITTING TECHNIQUES with Julie Nandorfy of Riverside Studios and SHAPING AND DESIGN IN KNITTED FABRIC with Nancy Halliday. I can’t say enough good things about these gals. They were fun, engaging and had some really good information and review to share with us. Debbie Marshall Wilson, owner of Sheep’s Ahoy and our Retreat convener, organizer and cat herder extraordinaire does a great job and the staff at The Glen House are always wonderful and tolerant of this bunch of crazy knitters. I couldn’t be happier about the new friendships and professional connections I made this year. There were many new faces and like all established groups, an infusion of new vitality and ideas is always a great thing. My own vending went well. I didn’t faint, stutter, blush beyond sunburn level or spill anything. It was a pleasant surprise to learn that one or two people know PSPRP and I think generally, folks like knowing the face behind a brand in the small world of crafting. Sales were good and I was grateful for the opportunity to ‘talk up’ my design philosophy, future path and the Berroco interview. I think that really helped lend me some credibility among this hugely talented pool of designers. BFF and I stopped in at the Third World Bazaar in Manotick Station on our way to NR in Gananoque. It was one of those (almost) screeching ‘180s’ as we caught sight of the small, yellow signs that announce this time-limited shopping event. BFF is the shopper half of our duo and it took no arm-twisting to decide to pop in. It was a delight! The selection is overwhelming and it would have been easy to spend much more time there than we did. As it was, we came away with some amazing finds from this unique shopping event. Everything in the TWB is fair trade and there are so many countries, crafts and artisan made items, you’d be hard pressed to not find something amazing. The staff were super, they obviously love what they do and were quick to help, knowledgeable, and even offering unsolicited (but welcome) compliments and advice. They are excited about their products and like seeing them go to a good home. This obviously struck a chord with BFF and myself. Fair to say we’ll be making this a regular stop next year. Riverside Studios table of temptation. NR 2015 – Day Three. Midday sun on the St. Lawrence. NR 2015 Swag – ALL Of The Pretty!! Classes and vending today – stoked! 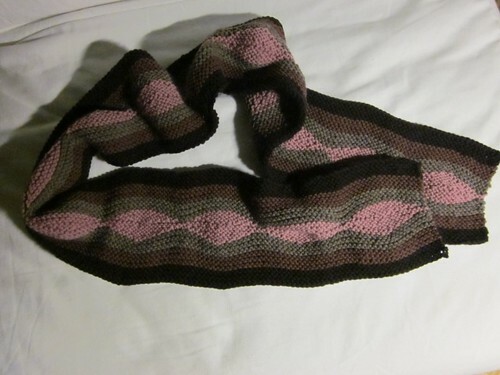 Undulation Scarf ~ Finished, a photo by Pointe Shoes Punk Rock And Purl Pix on Flickr. Trying something different – posting direct from my Flickr. So here ’tis: Undulation Scarf, finished and not yet blocked. Holy heck! This was a fast knit! Beginner worthy if you’re adventurous enough to try short rows. I love it! It’s the perfect capper to a perfect day. I was invited to write for a position at work that I’ve had my eye on and had applied for in early October and last month’s medical tests came back negative. Just a quick peek of the completed knitting, this will need to be blocked.